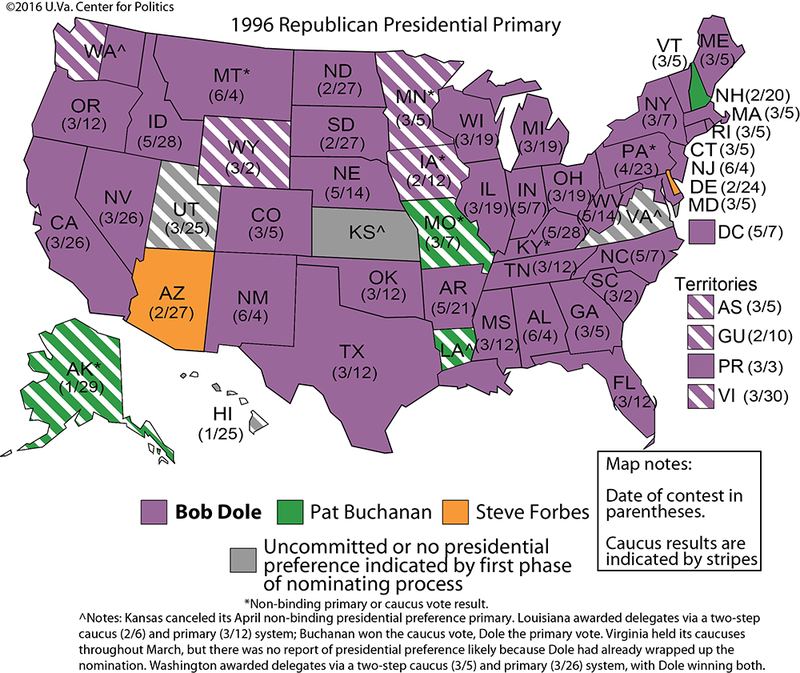 This is the first of a two-part series describing the state-by-state history of modern presidential primary voting in each party. We’ll look at the Republicans this week and the Democrats next week in advance of the start of the 2016 nomination season on Feb. 1 in Iowa. 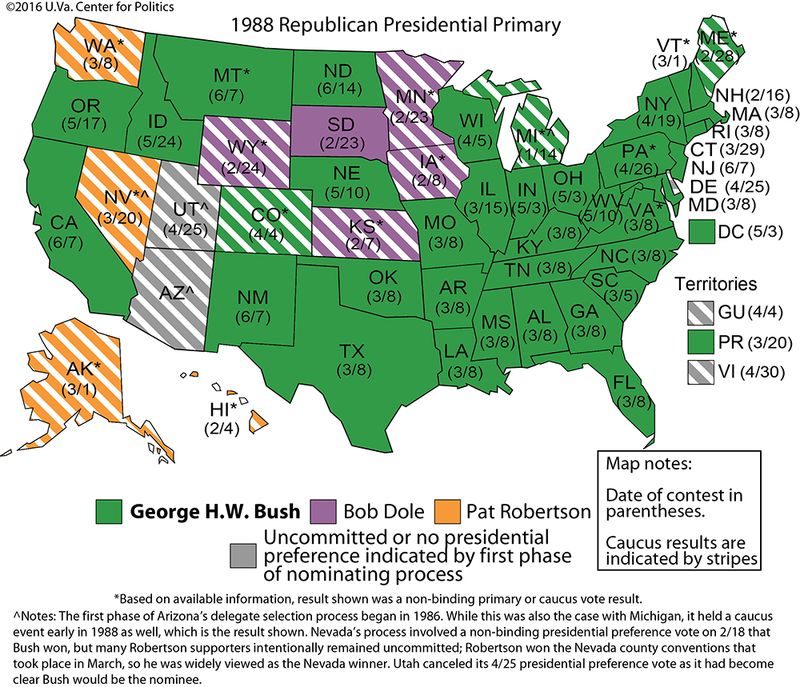 The presidential nomination process has a history of being fuzzy. For much of the nation’s political existence, starting in the 1830s, national party conventions selected nominees for the highest office in the land. At these events, the oft-used term “smoke-filled rooms” described the sometimes behind-the-scenes activity that led to the final selection of a nominee. Sometimes this person was an obvious, well-known national figure; other times, an unexpected, relative unknown captured the nomination. 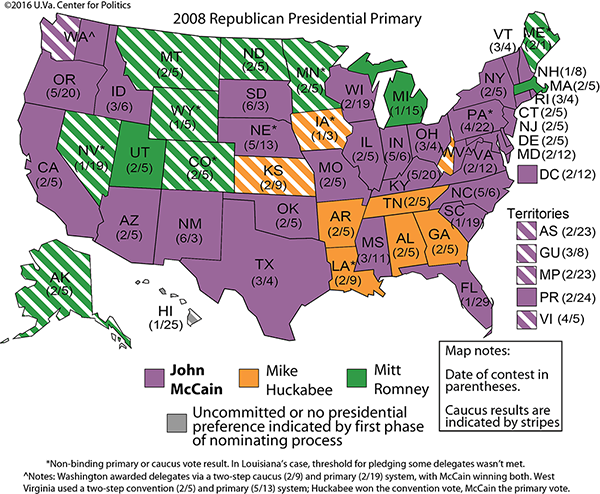 As time passed, more and more states began to use presidential primaries to either determine the delegate commitments of their state’s representatives at these conventions or to at least indicate the electorate’s preferences (non-binding events that have been referred to as “advisory primaries,” “beauty contests,” or, in the case of many caucuses, “straw polls”). Still, many states continued (and continue now) to use a series of caucuses, mass meetings, and conventions to pick their delegations, a process that can be murky and complicated. Historically, the candidate preferences of these caucus-determined delegations were more fungible and flexible, as they weren’t necessarily “bound” to any choice. The efforts by different news organizations to estimate delegate support for each candidate were as much art as science. After the chaotic and controversial 1968 Democratic National Convention, when Vice President Hubert Humphrey won the nomination after not running in a single primary, the national Democratic Party sought to reform its nomination process. It began to set down an increasingly nationalized set of rules that each state party had to obey, particularly certain guarantees for participation by women and minorities in state delegations and the distribution of delegate support to candidates in proportion to their vote support. This is why many view the 1972 Democratic primary as the first campaign of the “modern” era of presidential politics, as it was the first contest to feature many of these rules. While the Republican Party also went on to adopt many reforms as well, it importantly has never adopted proportionality as a universal rule, largely leaving delegate allocation methods to the state parties. This has led to a variety of systems, ranging from plurality winner-take-all states, to hybrid proportional states with winner-take-all thresholds, to states that allocated by only the statewide result or others that chiefly use the results in each congressional district, to variants of what are known as “loophole primaries,” where most or all delegates are named individually on the ballot (sometimes without a listed presidential preference) and directly elected by the voters in a congressional district and/or statewide. Although 2016 will see more stringent rules regarding the binding nature of Republican presidential preference votes under many of these systems, the GOP’s delegate allocation process is still incredibly diverse. Philosophically, this corresponds with each party’s political inclinations: Democrats have embraced a more top-down approach over the last four decades than Republicans, who have left more up to the states. As such, laying out the winners of individual state primaries and caucuses on the GOP side is harder to do. Yet the maps below seek to present the state-by-state outcomes for competitive Republican presidential nomination contests since 1976, as best can be recorded by election results, newspaper accounts, and election histories. Importantly, the maps attempt to set all things equal by recording the presidential preferences of states in primary elections or, in most cases, the first step in the nomination process in caucus states. In the case of the latter, individual delegates are often selected over the course of many months, and their presidential preferences are not always well defined. 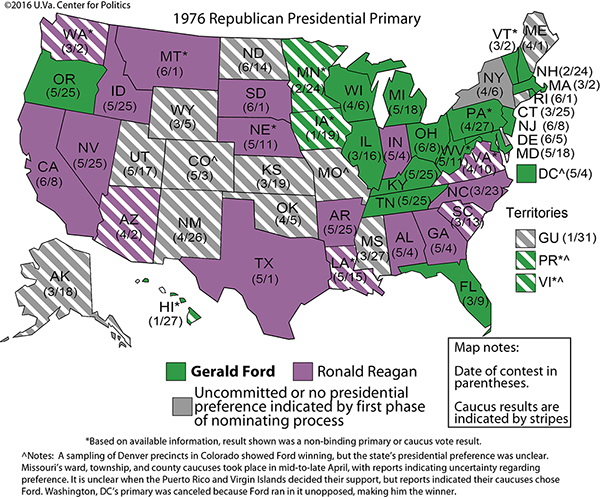 In 1976, for example, the first-step presidential preferences in many caucuses were not well documented, were based mostly on speculation, or featured small samplings of precincts that were sometimes highly disputed. Generally, it would have been easier to use the final delegate support votes at the GOP conventions. However, the preferences of delegations in most caucus states (and some primary states, too) shift over time as candidates withdraw from the race. So by using earlier points in the process to measure presidential preference, these maps somewhat diminish the effect of withdrawals on states that decided their eventual delegate support levels late. This standard attempts to make every election a time stamp of sorts on where the race stood in a respective cycle. 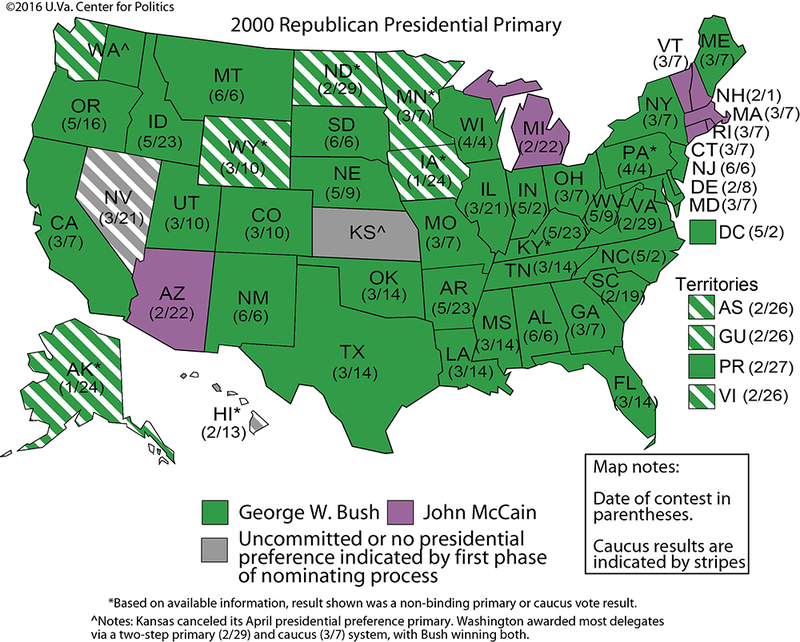 Of the seven nomination cycles presented below, the most noticeable pattern is that one candidate tends to dominate in the end. At least, this has been true since the heavyweight GOP tilt fought between incumbent (but unelected) President Gerald Ford and Ronald Reagan in 1976, the last time a nomination for either party went into a convention truly up for grabs. Perhaps the 2016 nomination battle will be the same, with one candidate eventually breaking away from the rest of the pack to win most primaries and caucuses. Or perhaps it will be the next 1976. Election watchers naturally hope for the latter! 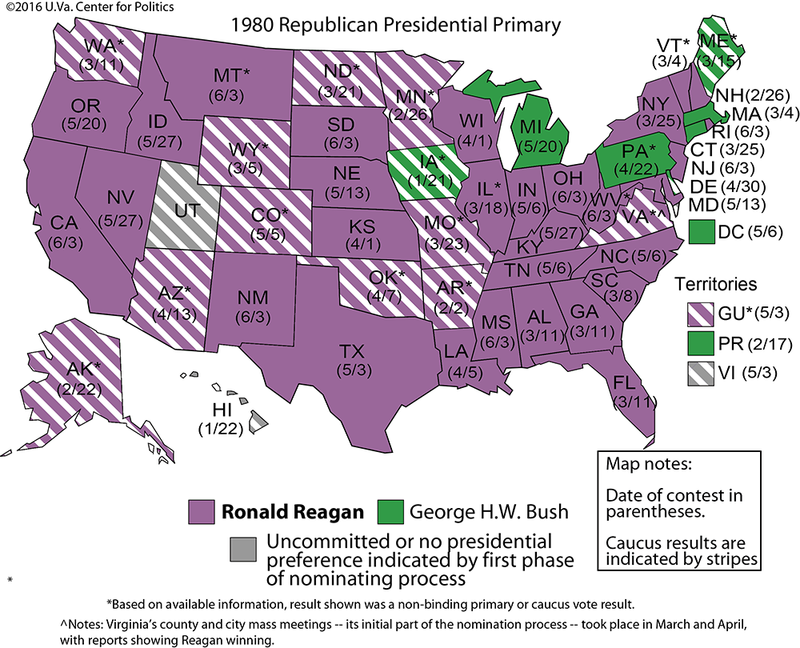 As the latest presidential voting begins in 11 days, here’s a look back at the past 40 years of competitive Republican primaries and caucuses. As you survey these maps, note one thing: Despite some big GOP fields over the years, only two or at most three candidates won a state caucus or a primary in a given nomination contest. In other words, many seemingly-promising candidates didn’t even win a single state. It’s something to keep in mind as the 2016 race begins with a dozen candidates. If history is a guide – and it might not be this time — only two or three of 2016’s candidates will ever finish first. 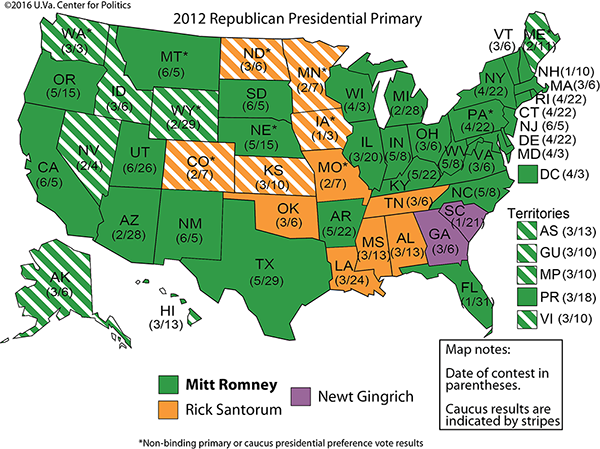 Notes: *Indicates that the primary or caucus in question was non-binding regarding delegates. Note that there are inconsistencies regarding how binding a contest truly was, especially the further back in time the election took place. The dates of many caucuses reflect the last day of a meeting period or the day of the straw poll in question. These events sometimes take days, weeks, or even months. In a few cases, the maps denote that a state used a two-step caucus (or convention) and primary system, in some order, to determine delegates.